Why do I do Karate? Why do I maintain this website? The contents of this page will always be subject to change, just as I am! 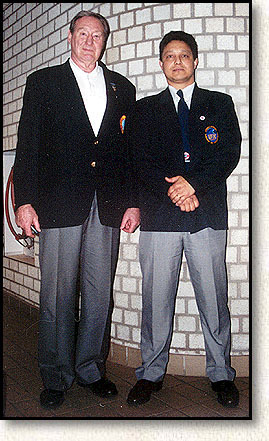 This picture of Hanshi Steve Arneil and myself at left was taken in August 1995, when he came to the Marrickville dojo where I train, to give a seminar. I'm on the right, in case you hadn't worked it out already! I started training in Kyokushin at the age of 13, for about a year, while I was living in Iran back in about 1972. The scoutmaster of the British School which my younger brother and sister attended was a shodan in both Kyokushin and Judo. The kids learnt Judo, and the older students could learn karate. I remember very little about it except that the instructor's name was Mr. Grant. (If you're out there and reading this, let me know how you are!) We only had an 8 kyu system there, which also included an orange belt, which is the highest grade I got to. I think it was the equivalent of what I now know of as senior yellow belt or 5th kyu. We were also required to know a bit of judo for the gradings. 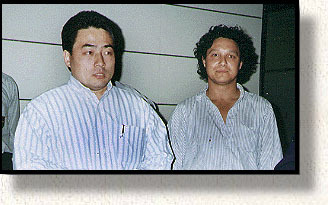 Kancho Shokei Matsui came to Sydney on January 31st, 1995. I was at the airport to (with about 50 others) to greet him, and Shihan Doug Turnbull managed to sneak in a photo here. Then, he had two blocks of granite placed on his chest while he lay down, and someone smashed them both with a sledge hammer. The impressive part was that, before he lay down, he broke a few bottles on the ground where he was to lie down! When he got up, there was not a scratch on his back! And thirdly, a couple of his yudansha attempted, unsuccessfully, to break an (empty) Johnny Walker bottle with a mawashi geri, while it was being held by the neck. Peter Chong shouldered the black belt aside, wordlessly saying "Let me show you how it's done!" and, by gum, he did! The glass from the shattered bottle literally sprayed across the school's drive way like water! I was sixteen and veeeery impressed! I joined his class. Unfortunately, I only got past one grading (starting at white belt), where I double graded, and then had to quit because my "A" levels got in the way. For those unfamiliar with the British education system, those are the final year high school exams. (For those who are interested, the results were Chemistry - D, P&A Math - B, English Lit. - F. Still, despite those results, I managed to do very well in first year Uni in Canada in both Math and Chemistry, and I still enjoy reading and writing, just not Shakespeare and Chaucer! ), and eventually got two degrees in engineering. After I came to Australia about 15 years later, I decided that it was time to do some karate again, and I found the nearest Kyokushin dojo to where I live. That's where trained from 1990 until I got my shodan, which was on December 15th, 1996. It only took me about 24 years to get there. 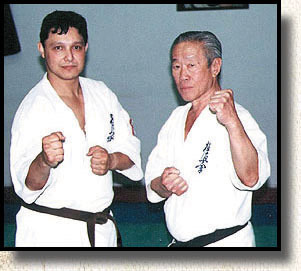 My initial training was under the IKO until Mas Oyama died, when my instructor left (due to the internecine struggles of the IKO) to join the International Federation of Karate (IFK), under Hanshi Steve Arneil. This was when I was a brown belt. Thus, all my dan grades have been obtained under the auspices of the IFK. 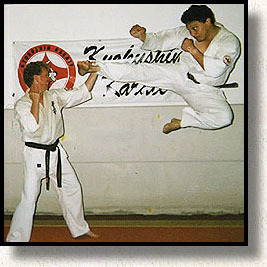 I was the senior grade in a class of about 10-15 adult students and up to 20 children, and sometimes, when Shihan Doug Turnbull was away, I got to teach, and that's where I realised that I had the ability for it. Which was probably a good thing, because I was not much of a fighter, being too old when I started already, and far too conscious of pain. I did have a few full-contact fights, but I'd rather not talk about them. A good question! One could take that even further and ask "Why did I start karate?" and "Why do I keep going?". The first is an easy one - machismo!. I think it fair to say that I speak for most men when I say that, as teenagers, many of us looked at karate as a way of appearing cool and tough. So what was my excuse at the age of 30, to start again? A bit of the same, tempered by the knowledge that there wasn't anyone for whom I would be cool, since my wife was overwhelmingly unimpressed by the idea. This is a picture of me showing off with Shihan Doug Turnbull. Essentially, what I wanted to do was to get some exercise while also getting something that would also be of use outside the exercise area. Kyokushin seemed like a good idea since is also provided a degree of self defence, even though, like total disability insurance and CPR, I hope never to have to use it. Besides, I hear that catching bullets with your teeth isn't taught until you're going for 11th dan, and I don't think I'll live that long, bullets notwithstanding! The uniform's also cheaper than for aerobics, though the view isn't always half as good! The second question is a bit harder to answer. After all, sparring and gradings hurt, the workouts are tough, and the joints begin to creak after a while, while all around me the 18 year olds have their groins making furrows in the ground while doing their splits! All in all, it would be much easier to sit at home and watch TV with a bag of chips in one hand, and a beer in the other. 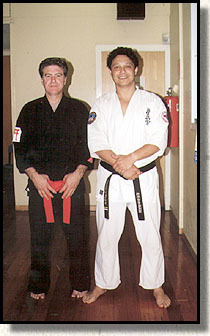 With Hanshi Toby Cooling (kancho of the Order of Isshin Ryu) at a seminar at Marrickville dojo, 1999. But no, I keep going to classes even when my foot is bandaged because I lacerated my toe while training and had to be in hospital for two days, when I have laryngitis from the flu and can't kiai (or breathe), when I can't move because my bones and muscles are sore from the grading the day before, when I go to a grading to spar and come back heavily bruised, even though I'm not being graded myself, and when it's 35ºC in the shade, among other things. My wife says it's because I'm an idiot. She's probably right. She often is. Still, I kept going and finally got my shodan in December 1996, and to my great surprise managed to get my nidan in December 1998. My sandan came around in 2005, on my second try, and I was awarded my yondan in late 2009. Karate provides me with a catharsis. I may have problems at work that nag me when I go home, but a training session knocks them out me within five minutes (not the problems, but at least the nagging feeling). I like the extension of my physical and mental stamina and coordination, the ability to row around with both my kids without getting exhausted (much), to be able to rock my children to sleep in my arms without my arms getting tired, to be able to throw them (and all the others in their daycare center!) up in the air (and catch them) and watch them laugh in delight - ahem - that was when they were 2-3 yrs old, of course. I don't do throw that anymore, though my daughter still asked me to until she was about 10! They're quite a bit older now (and sadly so am I), and of course accordingly bigger - and my son has also attained shodan. I like the way I feel when I'm not sore. And I like the the people who stick with training because, I think, most of them feel much the same way as I do, and they are nice, gentle people outside the dojo. At least those over 30, anyway, who have no major tournament aspirations! Around the time I got my shodan, I also started my own dojo, and this has been going ever since. It's not very big, and I don't try very hard to get students, but I believe I'm doing a reasonable job at teaching those who make their way to me, and I enjoy the teaching very much..
Cameron Quinn, in his book, says that the brown belt level is one of discovery and exploration. I started this as a brown belt, because it was a way of combining my interest in computers and karate. It allows me to play with the computer and conduct a worldwide exploration into Kyokushin at the same time. I started out just wanting to show the Martial Arts world the state of Australian Kyokushin, but the responses from the rest of the world led to me to expand it. Given, the parlous state of Kyokushin in Australia and elsewhere, largely due to the state of affairs in Japan, it's probably a good thing that I chose to internationalise this website, otherwise it would be a pretty uninteresing place to visit. My sincerest thanks to all those who have visited, and even more to those who have provided information to help make it what it is. Osu! I was born in 1959 which makes me older than I would like to have been when going for shodan. My father was Malay (he died in June 2002) , and my mother is Swiss, and I was (and still am, for that matter) the first of their 6 children. The youngest was born in 1975. Because my father was in the Malaysian Foreign Service, I've lived in 14 countries and speak 6 languages, 3 fluently and the other three not so. And I can get into trouble in a couple more! And it's about the same with computer languages. In 1981 I graduated with an Electrical/Electronics Engineering degree from Carleton University in Ottawa, Canada. In 1988 I emigrated to Australia, where I got a job as a research assistant at the University of New South Wales at the Department of Safety Science. I began research into the spectrum of the electromagnetic fields generated by household appliances and subsequently enrolled in a Master's of Engineering, which I later upgraded to a Ph.D. hoping to apply the results of my findings in the Master's work to some cells using in situ DNA hybridisation techniques developed by another PhD student in the School..
Alas, this was not to be. In the meantime, I got "promoted" to Professional Officer and had kids, well, my wife did, anyway. The first meant that I was basically a technician with a degree, and got to do things for people with Ph.D's who are too lazy.... errr, I mean, too specialised, to do it themselves i.e. the dirty work. I also developed (and now administrate) the PC network we have in what is now the School of Safety Science. Having kids meant having to go home on time every evening to share evenly the family duties, just as my wife shares evenly in the income generation by also having a full time job. So the Ph.D. got dropped due to lack of time, and the Master's is back on and hopefully it will be written up by the middle of 1996. (Update Dec 1998 : not yet done!) (Update Nov 2002 - Finally officially graduated! Was given an ultimatum because of the length of time it took!). What I really want to do is a Ph.D. in cave ecology, but that's another story. My other interests include caving, woodwork, and native orchids of Malaysia and Australia, and one of these days, I'll set up WWW pages for these too. On December 1st, 2009, I "retired" from the University, with a voluntary redundancy, after working there for almost 21 years. I intend to start up a full time dojo in the vicinity of my current one.